It is 1945 in the Pacific and the Allies are in the final days of the war. 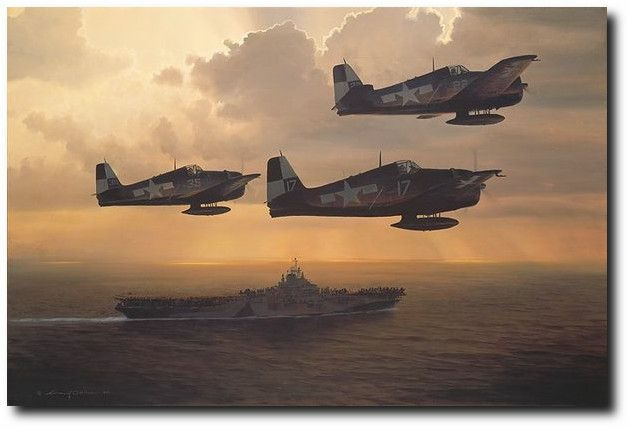 Three F-6 Hellcats are returning to the USS Hornet aircraft carrier (CV-12) after a routine patrol. They still have their tanks on, showing that they didn't meet any opposition while on patrol. Now, "the trap" is when they arrest aboard the carrier. “Right at this moment,” Phillips says, “nothing looms before these pilots except the everlasting challenge of landing on a carrier. This is when blood pressure rises and adrenaline pumps.” The majority of the patrol is over as was the majority of the war, but still there were two important things to do. For the planes, it was "the trap." For the military as a whole, it was concluding the war.